'Neither a borrower, nor a lender be." – with these seven words, spoken by Polonius in Hamlet, the Bard recommended the elimination of what had become, as of 2010, a $93 trillion worldwide bond market of which the U.S. bond market represented $37 trillion. By comparison the 2010 global stock market capitalization was $54 trillion of which the U.S. stock market capitalization was $21 trillion – there is no word that the Bard discouraged owning equities. The U.S. Treasury is the largest issuer of bonds worldwide. 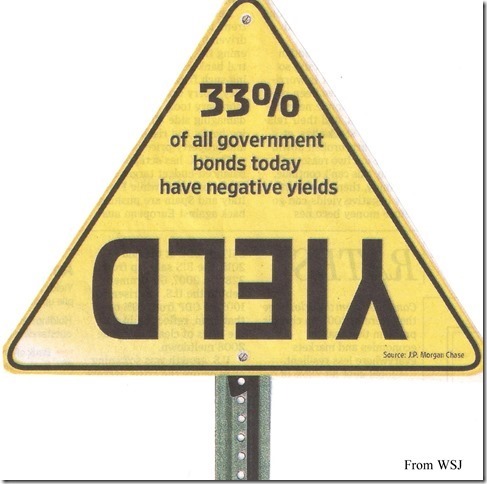 Because U.S Treasury bonds are backed by the full faith and credit of the federal government & its taxing power, investors perceive them as risk-free and highly liquid – recent demand for these securities has driven up their price & lowered their yield. 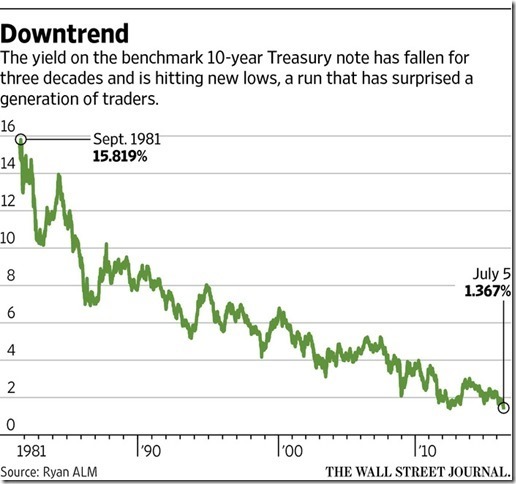 On July 5, 2016 the yield on the 10-year treasury note fell to an all-time record low of 1.37%. As the above graphic indicates one third of all the world's government bonds have negative yields meaning that the central banks of countries with negative interest rates shrink the electronic balance of deposit accounts of commercial banks daily by imposing a charge based on the money in the account. Yes, the investors (depositors in the commercial banks) in these countries pay the central banks to hold their money for them. 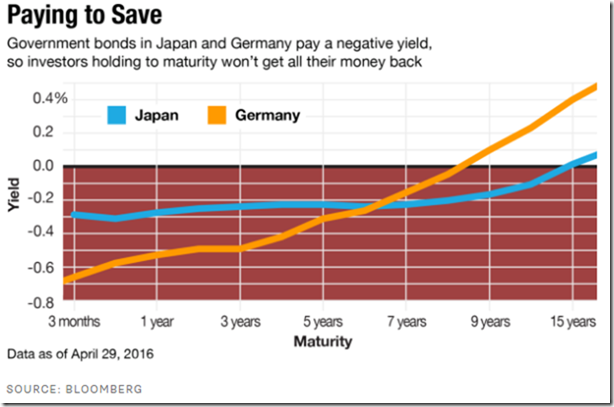 Accordingly negative interest rates, not just low interest rates, in theory are a great incentive for the investors in these countries to use their money to expand the economy by stimulating both consumption & investment. The European Central Bank (ECB) followed by the Bank of Japan (BOJ) have pushed the large economies of both Germany & Japan respectively into negative interest rate territory. See yield curves on graphic below. Although yields on U.S. Treasuries are @ record low levels they remain in positive territory because of a law passed in 2006 that requires the Federal Reserve (Fed) to pay interest to commercial banks on excess reserves deposited with the Fed – key wording in the law is "to be paid." But we are well aware that politicians have pens & phones & that one stroke of a pen followed by one click of a mouse & the U.S. could have negative interest rates also. 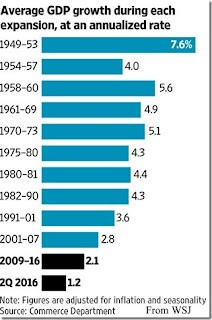 See graph below showing the decline of yields in America the past 35 years. 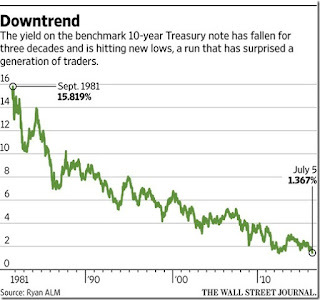 My attention is drawn to the above graph to the week of February 7, 1994 – I was in NYC when Greenspan started to preemptively raise interest rates from under 6% to 8% thereby ruining the value of bond funds all over America. Interest rates have never been over 8% in the last 20 years as shown on the above graph. All of the above highlights the fact that governments all over the world are trying to stimulate economic growth by means of monetary policy only – savers, whether young or elderly, are finding out how low we can go. Ever wonder why whenever you go into a local bank you are inevitably introduced to the bank's financial planner – investment officer who you find out ultimately is peddling high commission annuities that maneuvers you away from CDs? 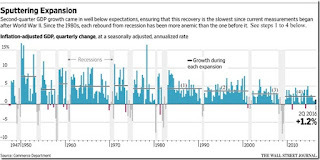 Is the stock market the next bubble to burst? The genesis & appeal to governments of such forced low interest rates has the added benefit of keeping deficits down – just imagine what the interest payments on the national debt would be if governments let the natural rate of interest prevail. On Friday the Commerce Department announced that U.S. GDP growth in the second quarter of 2016 was 1.2% – part of the weakest recovery since 1949. See graph below. 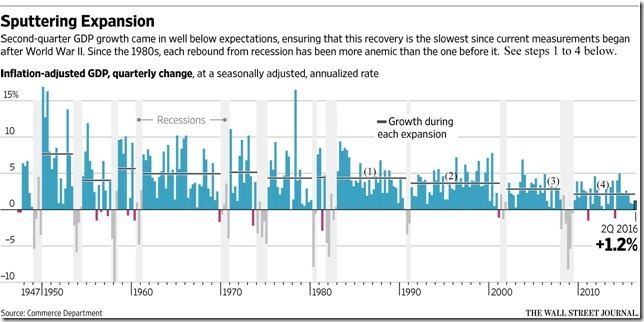 The graph below points out that since the 1980s each recovery from recession has been weaker than the one before. Just look @ the four horizontal bars (labeled 1 to 4) since 1980 to see the literal steps down in growth & accordingly our standard of living. Coordinate this with the graph immediately above for precise numbers. 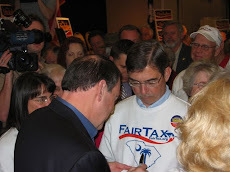 This post is written to show that the monetary policy of declining worldwide interest rates when applied without any responsible fiscal policy (i.e., tax reform like cutting the corporate income tax rate that has been talked about by virtually every politician in Washington for years or enacting the FairTax that has been successfully locked up in Ways & Means because the Joint Committee on Taxation has no means to evaluate it whether statically, dynamically, or any other way; & spending cuts if only following the weak sequester that barely got started before it was abandoned) results in stagnant economic growth. Just look @ all of the above data. 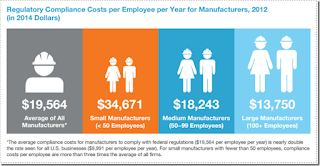 Adding insult to injury is that federal regulations under BO has increased so that the total cost of compliance in 2012 was $2.028 trillion (in 2014 dollars) – the annual cost burden for an average U.S. firm is 21% of its payroll. 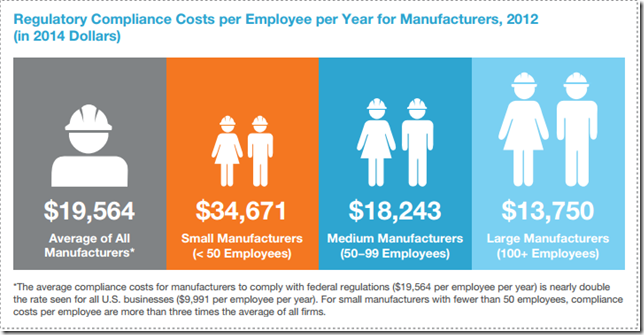 See graphics below – click on them to enlarge. Based on the above it is no surprise that businesses & investors have continued their cut back of investment that should be encouraged because it is the springboard for the growth & productivity gains that are the basis of an improved standard of living. Who can criticize them with Hillary Clinton the favorite (really any Democrat would be) in the electoral college? 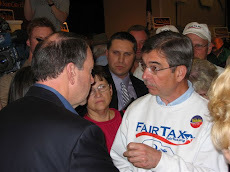 Higher taxes & more regulation is all that can be seen if a Democrat wins the White House with promises like expanding Social Security benefits, reintroducing the public option to the ObamaCare legislation, enacting $15 per hour federal minimum wage law, providing free college to people making less than $125,000 per year, mandating overtime pay for salaried personnel, & enacting paid family leave. These policies continue the type of policies that produced the current stagnate economy & do not make for a good investment climate. The fact that the positive interest rates in America is drawing money from negative interest rate accounts around the world to the U.S. bond market also means that the U.S. dollar continues to get stronger as investors buy dollars to purchase the positive yielding Treasury securities. The U.S. export market is hurt in turn by all this contrived manipulation by central banks because the artificially strong dollar increases the price of U.S.-made goods in overseas markets. "A system of pure, unregulated laissez-faire capitalism has never existed anywhere" – & that is most certainly true of 2016 America, as described hereinbefore, where 43% of the members of the Democrat Party believe in socialism more than capitalism & really have no idea what socialism is. Doug - great research and analysis. Your point that many, especially the young, incorrectly believe it is capitalism that has created weak economy and job prospects, is very significant. This perception must be corrected else we will quickly become a 100% Socialist, even Marxist country. Trump must concisely, clearly, and repeatedly explain what free market capitalism is and how it catapulted the US economy since 1776 to world leading levels, at least through 1980's and arguably the 1990's. He must explain that increasing Gov control, taxes, regulation, and spending results in an economy more resembling Socialism than capitalism, unmistaken fly since 2007. We can make the economy great again with a return to more free markets and reliance on private entrepreneurs for jobs, not Gov bureaucrats. This will take time and must be repeated as the Left, public schools, and elite media have been brainwashing the electorate for few decades. Trump can and must start immediately.